Are you and your girlfriends nature lovers who want to get off the beaten path and take farm-to-table to the next level? Pack your cowgirl boots and your appetite for a weekend getaway to the up-and-coming destination of greater Grand Junction in Colorado, a place that will please the palates of food and wine lovers alike. As soon as your plane prepares to touch down in Grand Junction, descending into a picturesque backdrop of pastel cliffs, you will feel like you have landed in a different world. The small airport welcomes you with a relaxed coziness where you instantly feel at home. This feeling of familiarity and homeliness will pervade your eating and drinking adventures as you explore the area. Two Rivers Winery and Chateau is the perfect place to start your journey into Colorado’s wine country. Slightly on the outskirts of town, the winery showcases the natural beauty of the area, as a gateway to the Colorado National Monument. The sophisticated accommodations will transport you to the elegance of Italy and more importantly, the gold-medal winning wine will please your palate. The owners are incredibly passionate and knowledgeable in wine making and will happily explain where in your mouth to look for tannins, acids and more. After your tasting and tour at the vineyard, head downtown for dinner at 626 Rood. This classy wine bar prints paper menus since they constantly change their dishes to feature ingredients grown by local farmers. If you have a special event to celebrate, alert them ahead of time because they love to celebrate birthdays and anniversaries with a printed announcement on the menu, just one example of how local the restaurant is. In addition to offering innovative modern American dishes with elegant presentation, the restaurant has extensive drink lists featuring local vineyards, distilleries and breweries. To sample multiple Colorado wines, try their “Elevation” flight. It would be a crime to visit Grand Junction without checking out its crown jewel, the breathtaking Colorado National Monument. 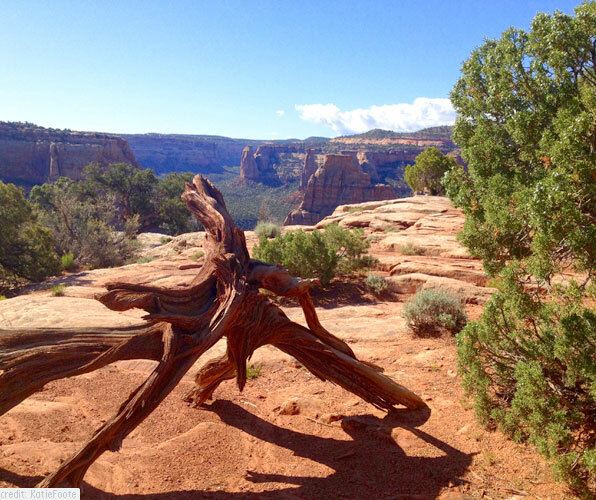 This petrified sandstone mesa was formed from ancestral mountains that were once higher than the Himalayas. Sometimes known as a “miniature Grand Canyon”, this area has all the natural splendor of the more famous attraction without the crowds. Often, you can explore the sandstone monoliths and red rock canyons, perfumed with the scent of juniper all by yourself. Keep an eye out for bighorn sheep and neon collared lizards. While the attractions of Grand Junction could easily fill a weekend, visiting Palisade is absolutely worth the 30-minute drive. The warm days and cool nights cause the fruit grown here to be especially sweet and has earned the town a reputation for growing peaches sweeter than their famous counterparts in Georgia. While peaches are undeniably delicious, the area has recently begun to diversify, hosting over 23 vineyards and a variety of unique agritourism offerings. Start your morning by treating your nose to a visit to Sage Creations Organics Farm. Pick your own lavender or organic herbs, go on a farm tour or buy handcrafted lavender bath & body products. 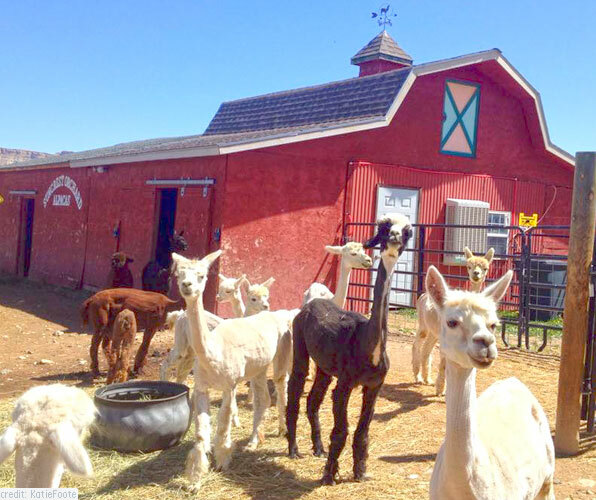 Next, head to SunCrest Alpaca farm and fiber works where you can meet the goofy alpacas that produce high-quality yarns, spun onsite. The owner will happily introduce you to his fluffy family and give you a tour of the miniature mill in back. Once you’re convinced that it’s 5 o’clock somewhere, rally your girlfriends to rent bicycles from Rapid Creek Cycles in the adorable, five-block downtown of Palisade. They have electronic bikes or cruisers with big baskets that can fit goodies from your cycle through the orchards, vineyards and wineries of the region. Check out recommended routes on the Fruit & Wine By Way that showcase the best of Palisade in five, seven and twenty-five mile, bike-friendly routes. Whether you and your girlfriends hit all of these attractions or just a few, you will finish the weekend feeling well fed, full of good wine and an appreciation for how farmer’s make the most out of the local land, whether it’s growing grapes, peaches, organic herbs or serving as a home for alpacas. The greater Grand Junction area of Colorado is the perfect girlfriend getaway to experience nature and epicurean delights in a relaxed and low-key atmosphere that is still under the radar of most tourists.